Geneva, 12 July 2017 - Senior representatives from 22 countries spanning Africa and Asia-Pacific met in Bangkok from 4 to 5 July 2017 to advance their common understanding of the key elements and provisions needed for effective legal frameworks and coordinated efforts to dismantle criminal networks involved in illegal trade in wildlife and forest products. 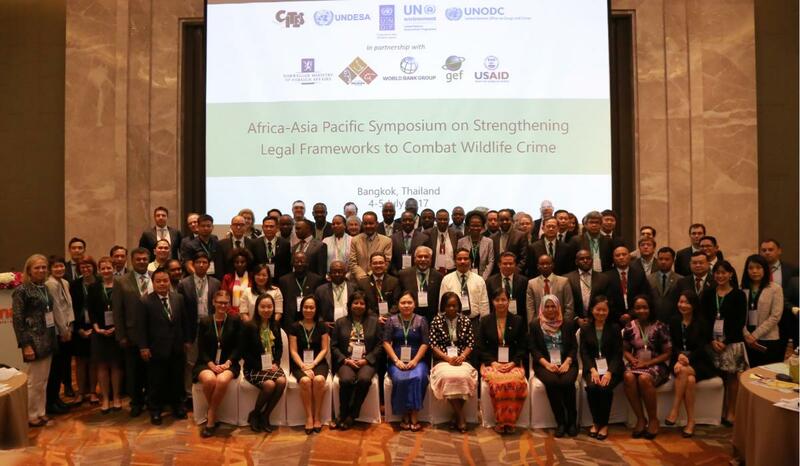 Over 90 participants held two days of deliberations at the Africa-Asia Pacific Symposium on Strengthening Legal Frameworks to Combat Wildlife Crime in Thailand. The symposium was the first major event convened by the United Nations Inter-Agency Task Force on Illicit Trade in Wildlife and Forest Products. Participants at the symposium included senior ministry officials, prosecutors, attorneys general and parliamentarians. The event featured exchanges in developing, enacting and enforcing effective national laws to combat wildlife crime, including illegal trade in timber and other forest products. It also discussed and advanced practical mechanisms for strengthening inter-regional coordination between Africa and Asia Pacific. “CITES provides the fundamental legal framework governing international trade in wild animals and plants. We are pleased to be a founding member of the UN task force and to make an important contribution to this valuable symposium”, said CITES Secretary General, Mr John Scanlon. “The main elements identified at the symposium for inclusion in national legal frameworks to combat wildlife crime include the key requirements of the CITES national legislation programme. These include provisions on the penalization of illegal trade, confiscation of illegally traded specimens, and mechanisms for inter-regional cooperation”. Wildlife crime transcends national borders, with Africa and Asia being linked as source and destination States for illegal wildlife products, such as African elephant ivory, rhino horn, pangolin and rosewood. These devastating crimes have driven some iconic species to near-extinction. They also undermine national security and development efforts, threaten the livelihoods of rural communities, impact food security, and put entire ecosystems at risk. Organized crime networks operating within and across these two regions routinely exploit gaps and discrepancies in national wildlife, forestry, criminal and other laws. The United Nations estimates that the illegal trade in wildlife is now the world’s fourth most lucrative crime after trafficking in drugs, people, and arms. The symposium offered an important opportunity for collaboration between the two regions, to strengthen legal frameworks and cooperation to address the illicit trade in wildlife and forest products. The UN Inter-Agency Task Force was created in 2016 to provide a holistic and comprehensive UN response to the multi-facetted problem of illegal trade in wildlife. It has its origins in the 2015 UN General Assembly resolution calling upon the UN system to bring its complimentary capacities to bear on combatting illegal trade in wildlife. The eight original member entities of the Task Force are: CITES Secretariat, UN Development Programme (UNDP), UN Environment, United Nations Office on Drugs and Crime, Department of Economic and Social Affairs, Department of Political Affairs, Department for Peacekeeping Operations, and Department of Public Information of the UN Secretariat.